Zeagle Ranger Jr Youth BC BCD w/ Rip Cord System Size JR Black Scuba Diving Gear. This is a fantastic price on a Zeagle Ranger Jr Youth BC BCD w/ Rip Cord System Size JR Black Scuba Diving Gear. This great Zeagle Ranger Jr Youth BC BCD w/ Rip Cord System Size JR Black Scuba Diving Gear features. Comes in a standard smoke gray color with black trim. The shoulder is designed with the new super duty Airlock buckle that will swivel to adjust the harness to the body's contour to eliminate binding and restriction of movement at the chest and underarm areas. With the addition of harness type webbing and a new threading arrangement the diver can easily add more D-rings and other accessories conveniently on the shoulder. This feature will now allow the technical and accessory minded diver to further set-up their BC to what they need for the type of diving they are doing. A right-hand shoulder dump with pull knob has been added and conveniently placed on the inside edge of the right shoulder pad. The dump valve acts also as an additional safety overpressure valve. The new LTD still maintains the best features of the old LTD.
A lumbar pad is permanently mounted in the rear of the vest section. The Removable rear weight system is included. 2 18lb capacity shot pouches are included. An innovative roll down pocket is incorporated into the cummerbund, and stays completely out of the way and hidden until needed. An extra set of vertically mounted D-rings are positioned ideally for mounting extra cylinders or accessories. Two additional 1.5 D-rings are located at the bottom rear of the vest. A Zipper attachment system mounted inside each wing of the bladder allows for the attachment of a variety of carriers and accessories, including Pony bottle carriers, Spare Air carriers, extra pockets, and grommet panels. Heavily reinforced 1050 denier Ballistic nylon construction. 44-lb lift capacity Ballistic bladder. Single buckle waist closure combined with elastic waist panels. 11 grommets for mounting twin cylinders. Single or twin tank capability. 4 Stainless angled D-rings on shoulders. 2 Stainless D-rings on vest. 40-lb capacity Ripcord weight system. Please note this is a New item. 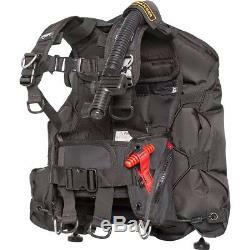 This is a fabulous price on a quality Zeagle Ranger Jr Youth BC BCD w/ Rip Cord System Size JR Black Scuba Diving Gear. Quality, versatility, and price, What more could you ask for? We strive for GREAT customer service! Item(s) must be in original condition (new, no tears, no odors, etc). Customer must provide original invoice and RA#. Boxes, we need your telephone number, and it is only to the 48 contiguous States. Powered by SixBit's eCommerce Solution. The item "Zeagle Ranger Jr Youth BC BCD with Rip Cord System Size JR Black Scuba Diving Gear" is in sale since Thursday, March 15, 2018. This item is in the category "Sporting Goods\Water Sports\SCUBA & Snorkeling\Buoyancy Compensators". The seller is "houseofscuba" and is located in San Diego, California. This item can be shipped worldwide.